The shocked faces of the 30,000 spectators said it all. This was no longer a game, it was a moment of human tragedy: at stake was not a trophy, but a young man’s life. One moment the crowd had been shouting at their heroes, groaning at their mistakes, mocking their opponents, then, suddenly, there was a confused hush. A Bolton player far away from the action was lying face down in the grass. The television commentator spotted him and the cameras zoomed in. Had he taken a bad knock? No, he had simply collapsed. Within moments the commentator’s tone grew sombre. Despite having a bank of high definition closeup cameras at his disposal, the producer of the television coverage held on to a wide shot. 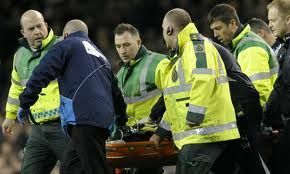 In his control van parked outside the ground, he could see on the other cameras how six paramedics were frantically trying to revive the unconscious player. As they tried vainly to restart his heart with a defibrillator, the director pointed his cameras at the crowd: people were clinging to each other in disbelief, weeping powerlessly, willing the young man to get up, not believing the reality of the situation just a few yards in front of them. What should have been a terrible private moment of personal crisis was being enacted in full public display. 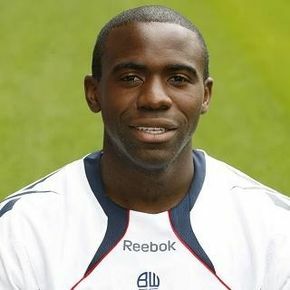 From time to time, a chant went round the ground, the whole crowd calling out his name: “Fabrice Muamba”. Just 23 years old, Fabrice was born in Kinshasa, in what is now the Democratic Republic of Congo. His father fled the country with his family during the chaos following the military coup against the dictator Mobutu. Fabrice was just eleven when he was uprooted to East London, speaking not a word of English. Yet he was incredibly bright, and passed 10 GCSEs as well as A Levels in English, French and Maths. Meanwhile Fabrice’s real passion was football. He was good – fast, with exceptional control – and was snapped up straight into the English top flight. Indeed, he was so good that he was selected to wear the white shirt of England 57 times before he’d reached the age of 21. At home, he and his girlfriend Shauna were looking happily to the future. They already have a son called Joshua Jeremiah; on Valentine’s Day they got engaged to be married. Then on Saturday, in front of millions, Fabrice’s life was put on pause. We ask so much of our sportsmen and women, yet we sometimes forget that they are all just ordinary human people, who would be exactly like the rest of us, had not a quirk of extraordinary ability led them into a world where only the best will do. As fans and supporters, we tend to focus only on their few minutes of supreme effort, forgetting just what intense commitment and training goes into every move. The cheers of the crowd can turn to boos with one bad pass. Meanwhile the media whips us up into frenzy with talk of wealth, foibles and failings, while our footballers are expected to walk the very cliff edge of human physical achievement. Our Premier League players now operate at a level of fitness, energy and skill that could not have been dreamt of when Muamba first kicked a ball on the back streets of Kinshasa, let alone when I was a boy. It’s moments like this when I can’t begrudge professional footballers one penny of their earnings during their painfully short careers. Nowadays we expect feats of physical endurance way beyond the design specifications of the human body. Why are we surprised when, sometimes, and quite unexpectedly, the human body rebels? Quite why Muamba’s heart gave way at that moment we don’t yet know. But throughout the country every football fan, irrespective of allegiance, is praying for him. At the end of the day, we all know it’s only a game.